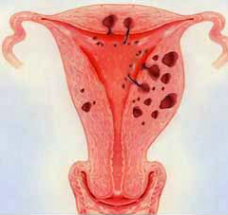 Adenomyosis is a condition in which part of the endometrium, or the lining of the uterus, becomes implanted in the muscle wall. This results in small pockets of bleeding within the muscle at period time, resulting in painful periods that may also be heavy. Ongoing pelvic pain between periods and spotting is also possible. 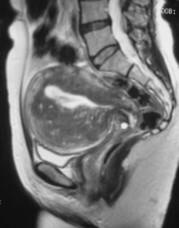 Adenomyosis may occur diffusely throughout all or part of the uterine muscle (so-called diffuse adenomyosis) or maybe more focal resulting in a localised adenomyoma.